The FX are composed of different layers of scratched plexi glass, reflection, light and other grungy and dusty layers to get as close to realism as possible, see in the video below how it's been composed. Please note this was made for use with a 21:9 ultra wide monitor (best bang for your buck considering width and Marquee monitors), other aspect ratios might not look as on screenshots. a. Realistic Marquee FX - With Marquee holder & Plexi FX. b. Realistic Marquee FX Only Plexi - Without the Marquee holder, only Plexi FX. 3. Choose the style XAML file you want, they are located and named in Zip files. a. 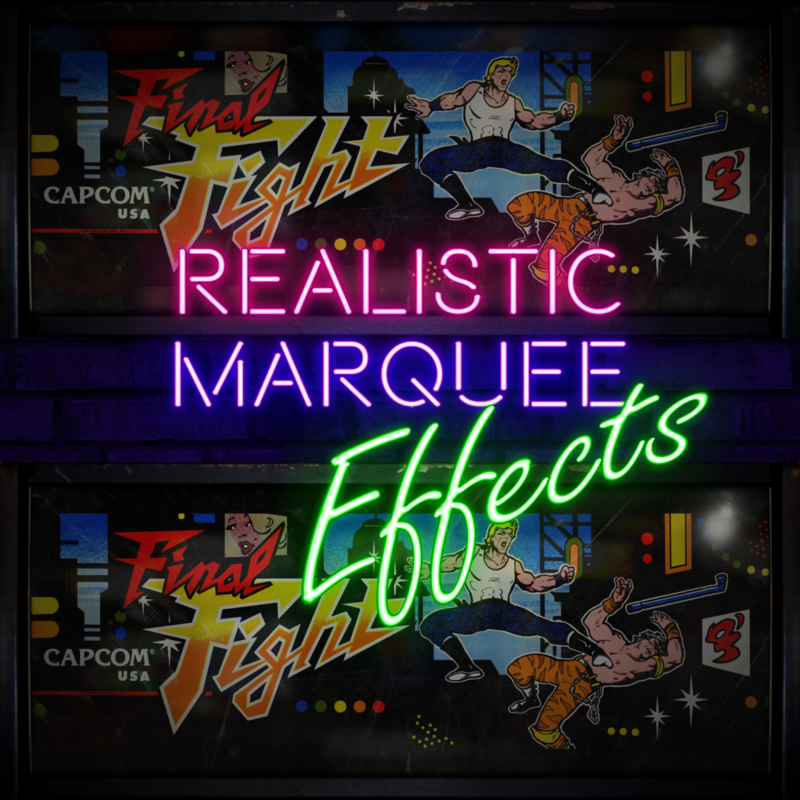 Realistic Marquee FX - Complete: With Marquee holder, Plexi FX and Magic Screen Filler. b. Realistic Marquee FX - Sans Filler: With Marquee holder & Plexi FX but Without Magic Screen Filler. c. Realistic Marquee FX - Plexi FX & Filler - Without Marquee holder, With Plexi FX and Magic Screen Filler. d. Realistic Marquee FX - Plexi FX only: With Plexi FX but without Magic Screen Filler and Marquee Holder. 4. Pick the style you like and overwrite the GameMarqueeView.xaml file in the 'your theme of choice/Views' folder, might be a good idea to back up the file first however. 4 New Subtle modes: No light in the upper right corner and less dirt, a cleaner Marquee with a bit of scratched plexi. Marquee holder is also darker lit. e. Realistic Marquee FX Subtle - Complete: With Marquee holder, Plexi FX and Magic Screen Filler. f. Realistic Marquee FX Subtle - Sans Filler: With Marquee holder & Plexi FX but Without Magic Screen Filler. g. Realistic Marquee FX Subtle - Plexi FX & Filler - Without Marquee holder, With Plexi FX and Magic Screen Filler. h. Realistic Marquee FX Subtle - Plexi FX only: With Plexi FX but without Magic Screen Filler and Marquee Holder.